The AMRUT ASSAULT begins! Eight Amruts in two weeks. And I'm starting with an old (with old meaning "since 2012" in this case) favorite. 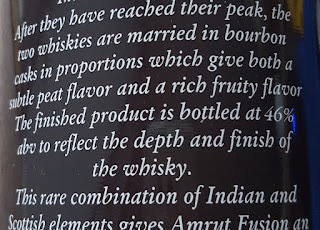 I reviewed Amrut Fusion back in April of 2012 -- batch 04 in that instance -- and loved it. Loved it, Loved it, 90 points, etc. But in the final section of my report I detailed how the Fusion may have the largest carbon footprint and requires the most petrol of any whisky in existence. I ended the piece saying, "As tremendous as this malt is, I will probably never buy a bottle (mini or otherwise) of it......until container ships are run on happiness." Well, container ships still run on civilization's black tar heroin, but I bought a bottle anyway. At least I waited nearly four years. 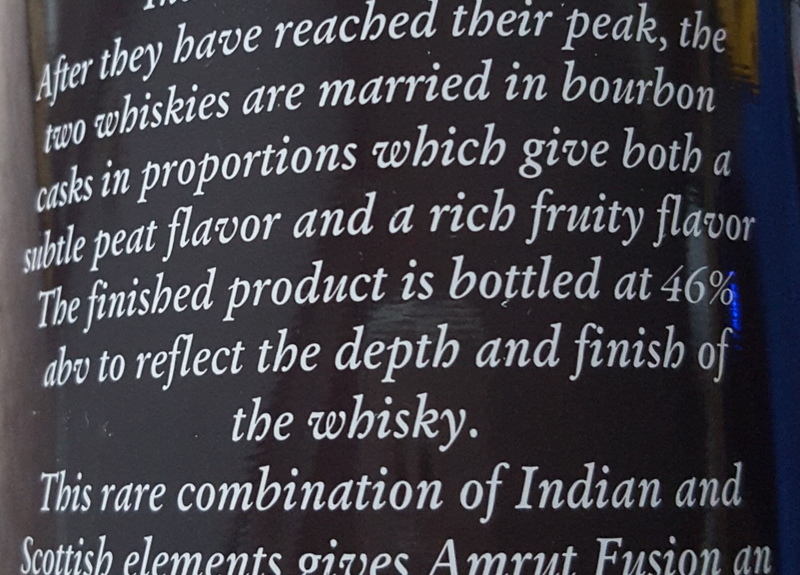 So, what is Amrut Fusion exactly? One part unpeated Indian barley and one part peated Scottish barley are mashed and distilled separately, then (like many human beings) are married together in ex-bourbon casks for a short period of time, ultimately getting bottled at 50%. Note the "short period of time" mentioned twice. Because of the heat and humidity in Bangalore, the Angels are big ol' drunks, sucking down 10-16% of a cask's contents per year. But that also means interaction between the oak and spirit is intensified during maturation. The last I'd checked, Amrut was following SWA's guidelines, so its single malt whiskies are at minimum three years old. But, again, three years in Bangalore ain't like three years in Aberdeen. I've had the Fusion on a number of occasions, at tastings or bars, since my review and I've continued to enjoy it every time. This liquid reviewed in today's post was from my own bottle at just above the halfway mark. This was one of my Winter Whiskies, though sadly our winter didn't really show up. El Niño took a pass on Long Beach. Oddly, the whisky's metal tube says, incorrectly, that it's bottled at 46%abv. The nose starts out with lots of barley, cinnamon, and ripe banana. Actually it's not banana, but chirimoya (deep cut!). With a few minutes of breathing time, a fascinating balance of characteristics develops. On one level there are notes of white spirits like kirsch, eau de vie, and rye new make. Then there are the phenols, clove cigarettes and heathery peat. And then there are the fruit and flower notes like melon, lemon candy, and roses. Considering the maturation environment, it's surprisingly light on the oak. The peat is much louder in the palate, smoldering, very rich. A load of spice, like cloves, cinnamon candy, cigar tobacco, and chili oil, keeps any young sweetness in check. There's also hard toffee, ripe banana (in a good way), and a tiny bit of cocoa. The finish is heat and peat forward. Some spearmint leaves, charred beef, chili oil, hints of young rye, and caramel. It's never sweet, though it's not terribly long either. The barley is met with a HUGE hit of anise in the nose. That's followed by dried cherries, wood spice, butterscotch, orange oil, and cinnamon. The water totally tames the palate, sweetening it up. It's malty and desserty now. More cinnamon and vanilla. Marzipan. A mellow bitterness meets with a spicy zing. The finish gets increasingly sweet as well. Some caramel and a slight bitterness mingles with the peat. This is very young, but very good. I prefer it neat, but if you need to sweeten it up then add water, a little at a time. A lot of elements ping about in the complex nose, and something new seems to show up every time I pour a glass. And though the palate is less complex, it's focused and rich, my favorite part of the whisky. The finish is its weakest spot, but it's not terrible, just a little brief and narrow. The price on this whisky has only gone up only $5-$10 over the past four years (hooray! ), though the days of finding it for under $60 in California are over. 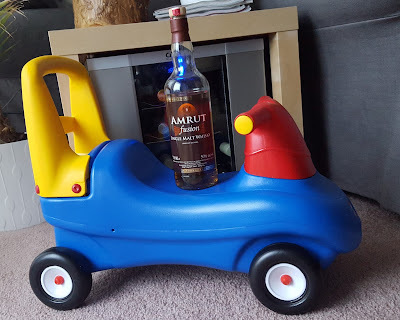 But Amrut has kept the good bottling strength and the quality remains high, so one will find more excitement in a bottle of Fusion than many single malt scotches in its price range.